Have you heard of NaNoWriMo? What about #the100dayschallenge? Or Inktober? No? Well they are short term creative challenges that help people worldwide work together to accomplish the big goals of writing a novel in a month, exploring their creativity for 100 days straight, and creating one ink drawing everyday in the month of October. 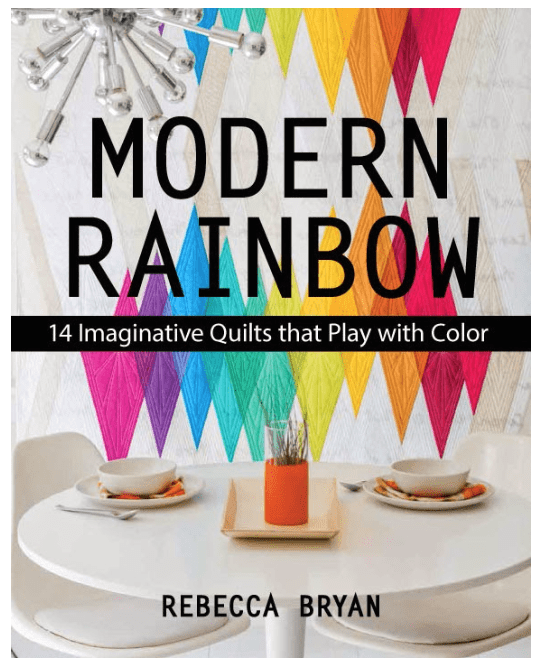 If you’ve ever wanted to do something big or outside your quilty comfort zone, then participating in a creative challenge, like these, might be just the incentive you need to get going and stay on track. Move On to bigger things (this one’s the best!). 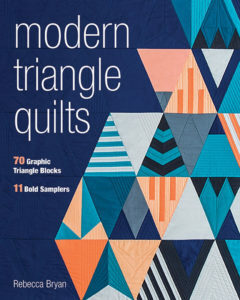 Participating in a challenge with a deadline is a great way to finish a quilt. By giving yourself a firm deadline there’s less chance the project will linger and be added to that growing work in progress pile. Creative decisions get made more expediently, bindings get glued on. We do what it takes to get it done! From start to finish, challenges are a great way to get your off your couch and track your progress as you finish strong. In the Pantone Challenge, we’re staying on track as a community by breaking up the quilt making process into smaller chunks. There are also weekly photo prompts to check ins. By using the weekly photo prompts, you can keep in touch with the community and up to date. You’ll see photo prompts from the very beginning of the process (e.g. fabric pulls and cutting), to the muddling middle (e.g. Progress and Behind the Scenes), to the last push to the finish (e.g. Last Minute Hustle). And as the deadline looms, hopefully you’ve kept up and are feeling good about your progress! You can always go about your own personal challenge whenever, but participating in a challenge in real time allows you access to the hosts and the community of creatives working through the challenge. Struggling with color or technique? Stuck on an idea? Need motivation? Ask the Facebook group or browse the Instagram community. There’s a wealth of knowledge in our social networks. As a host of the 2019 Pantone Quilt Challenge, which is now live, I’ll be popping in on Instagram Stories and such to give support on the Pantone Challenge. On the docket this week? Help with choosing colors and palettes. Participating in a challenge is a great way to meet like minded creatives from around the world. You won’t be working alone! 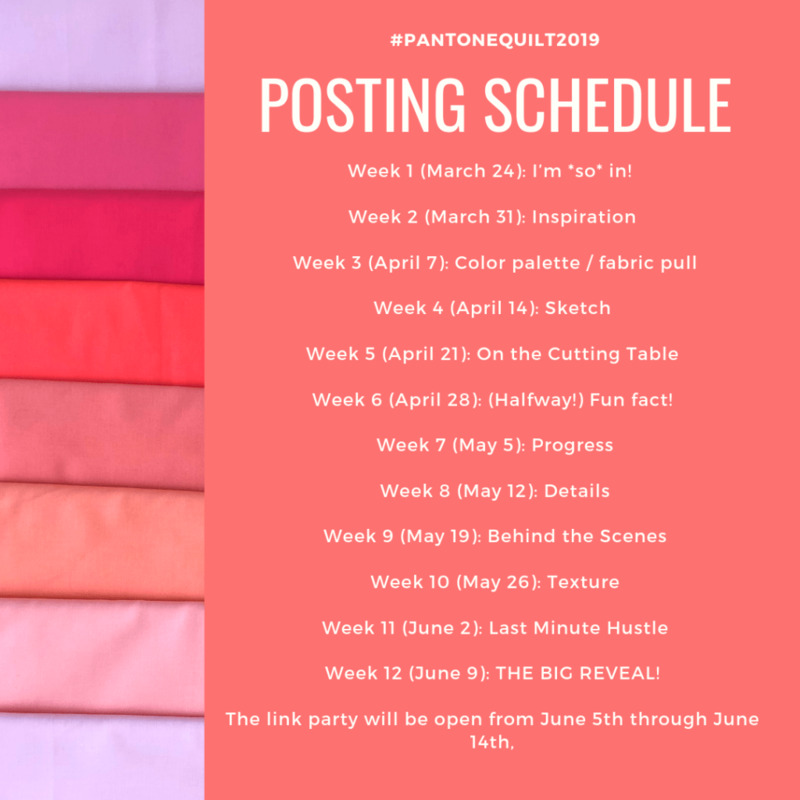 By using the hashtag #PantoneQuiltChallenge or #PantoneQuilt2019 and posting weekly, you’ll likely be introduced to quilters from around the world who are also working through their challenge quilt. Social media is pretty cool! Let’s make it cooler by meeting other cool people! Helloooo! Completing your creative goal is huge. But, you never know what can come out of your challenge! It’s possible there are bigger things in store than *just* completing the challenge. This year is the 5th year for the Pantone Quilt Challenge. Since beginning in 2014, hundreds of quilts have been made and lots of prizes have been shipped out. But ya know what else? Pantone Quilters have moved on to showing their work at quilt shows nation wide, such as QuiltCon. 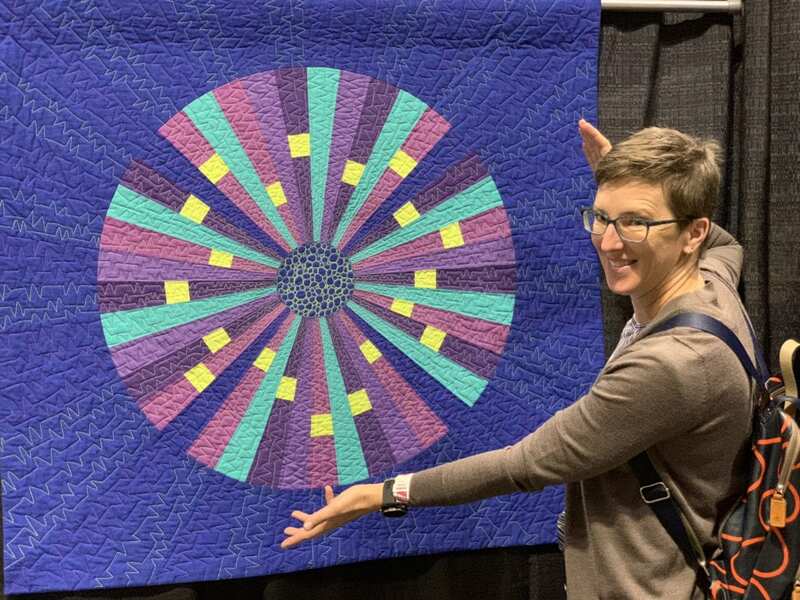 Elizabeth, who won Judge’s 1st Prize in the “Just the Top” Category in 2018, is pictured here with her very same quilt, “Ramps”, at QuiltCon in Nashville. Yah! This is LaVerne visiting Kelly’s Flower Hat Jelly Quilt at the 2018 Pacific International Quilt Festival in Santa Clara, CA. Thanks for sharing! And last year’s winner in the Viewer’s Choice – Quilts category, Kelly, showed her Flower Hat Jelly quilt at QuiltCon in Nashville (Yah!) but it will also show at the Desert Museum in Tucson, Arizona in a SAQA show in October. It will also show at AQS Spring Paducah in Paducah, KY in April 2019 and at SAQA’s “Connecting Our Natural Worlds” exhibit, which debuts in October 2019 at the Arizona-Sonora Desert Museum in Tucson, AZ. Daniela‘s Purple Haze quilt, which won Judge’s 1st Choice – Just the Top Category also hung at QuiltCon 2018. Yah! And Amy Schelle, not a winner in the Pantone Challenge last year, is a 3rd place winner in the Monochromatic challenge at the North Texas Sewing Expo. The Pantone Quilt Challenge is a wonderful challenge and end, but do think about where the challenge can lead. Regardless of if you win the Pantone Quilt Challenge, think of your quilt as a potential stepping stone to bigger things. (If you’re into that sort of thing!) 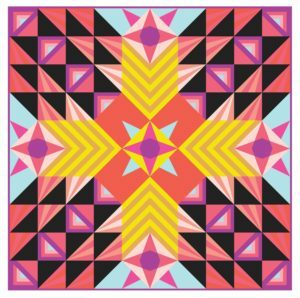 Submit your quilt to magazines and quilt shows to showcase your talent and your artwork. To Sum Up! You Should definitely participate! Challenges, like the Pantone Quilt Challenge, are a wonderful way to tackle a big creative, or quilty, goal. Having a deadline and staying on track with the weekly prompts are a great way to make progress and complete your goal. Participating in real time can give you added support by way of the world wide challenge community and access to the host. And finally, while completing a creative goal is hugely satisfying, you final product might take you to do bigger things! 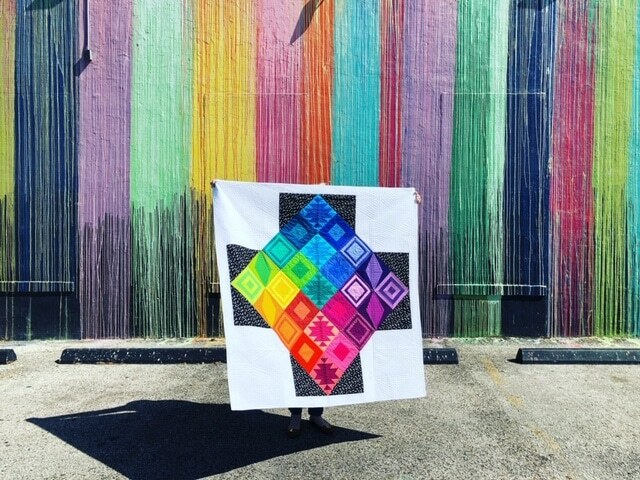 Get involved with this year’s Pantone Quilt Challenge. Learn more here.